WINGS VS HAWKS SCP WEST FINAL '09: WHO WINS? HOW MANY GAMES? It was a calculated blow-up. Trying to motivate his team. It has come down to this for the Blackhawks: Win three games in a row against the defending champion Detroit Red Wings, or shave off the playoff beards and start summer vacation. The Hawks are on the brink of elimination following their 6-1 defeat to the Wings in Game 4 on Sunday that left them trailing 3-1 in the best-of-seven Western Conference finals. Game 5 is Wednesday night at Joe Louis Arena. "It's not going to be easy," Hawks winger Troy Brouwer said. "They're a great team, but we feel like we have the character and the skill and the grit that we can come back. We have to look at it as one game at a time and go into Joe Louis and win Game 5." If there was ever time for the one-game-at-a-time cliché, it's now for the Hawks. They were unable to maintain momentum from their 4-3 overtime victory in Game 3 on Friday night as the Wings dominated in every facet in Game 4. "We can't win three games at once," winger Patrick Sharp said. "We have to worry about the next game on Wednesday in Detroit. We need to have a desperate effort." The Hawks can be buoyed a bit by their effort in Games 1 and 2 in the Motor City. They were tied 2-2 in the third period of the opening game before falling 5-2, and they extended the Wings to overtime in Game 2 before succumbing 3-2. "We played two pretty good games in Detroit to come out with nothing," coach Joel Quenneville said. "Building off those two games and the three games going into [Sunday] were competitive and close. "We have to get there knowing we have to be better than we were [Sunday] and fight our way right back into this. We're going in there with a one-game attitude." The task lies somewhere between formidable and impossible, but the Wings aren't yet printing Stanley Cup finals T-shirts. "You just have to continue to play your game and focus on yourself, understanding all the time that you've done nothing until this point," Wings coach Mike Babc0ck said. "I think that's very, very clear. "As soon as you let up for one second, and the other team gets more focused, then they beat you. So you just have to stay doing what you're doing and try to make the adjustments you need to win the next game." In the history of the NHL playoffs, only 21 teams have fought back from a 3-1 deficit to win a series. The Hawks never have done it, and the last team to accomplish the feat was Washington this season in the Eastern Conference quarterfinals when it won three straight over the New York Rangers to advance. "The thing we have to do now is focus on the first game, on the next game coming up," center Sammy Pahlsson said. "We can't try to think about the game coming up after that. We have to do it right now. The first period coming in, the first shift, that's where our focus has got to be. We've got to win that game." shabbs wrote: It was a calculated blow-up. Trying to motivate his team. It won't work (not saying they'll lose, just that this can't motivate them). They know full well that a 6-1 loss cannot be blamed on a roughing call. He may have deflected the questions away from "Were you guys celebrating or something?" line of questions, if that was, in fact, what had happened. That would buy Quenneville a little goodwill from the team, but not enough to push them to a win. No, the win has to come from the players' desire to not go quietly into the night. Personally, I wouldn't mind if they win one more, but *only* one more. Stranger things have motivated teams in the past. Take the infamous shot at Neidermeyer at the end of the period vs. the Ducks in 07. I'm certain they built that thing up to epic proportions to the point each and every Duck player was frothing at the mouth at the sheer injustice of it all. They come out like gang busters after that and took over the series handily. Forget one game at a time... it's now down to one shift at a time methinks. Do we need a separate cliche thread? Lidstrom and Datsyuk practice. Still no decision reached. Q. Will Marty and Nik be game-day decisions? JOEL QUENNEVILLE: They’re day-to-day. They’re both coming on the trip. We’ll get a better assessment at tomorrow’s skate. Q. How do you personally approach this game tomorrow night? We’ve heard the players say you can only win one game at a time. After what happened Sunday, how do you approach it? JOEL QUENNEVILLE: Well, I think our focus is that we have to play our best game going forward. There are some areas as we progress in the series where we’ve had good stretches against them. But at the start of the series, we’re talking about we have to play perfect hockey. We have to be at our best. All elements of our game have to be in order and effective. We’re looking at it as 'small picture', shift to shift. 'Only the one game' is our approach. I just think that for the last game, it’s easy to get excited about the next game because not much happened that was good in our favor. I just think that we had a couple of strong games in Detroit where we were close and we know we've got to be better. So I think there’s a little bit of excitement going in there tomorrow. But we’re only looking at the small picture. Q. Players are talking about composure. Does that include you? JOEL QUENNEVILLE: Absolutely. You know, I think we’re all in this together. I think as a coach and as a staff and as a team and as players, I’d say a steady diet of things we talk about, discipline, particularly this time of year. And we tell our team 'play hard during the whistle'. I think as the game eroded there, discipline eroded last game. But I think going forward, you know, we always stress the importance of staying out of the penalty box against this team. But I throw myself in that same boat of doing what I have to do to make sure that we’re focused and concentrating on the right things. Q. Seems like everyone is counting you out. Do you use that as a rallying point with the players? JOEL QUENNEVILLE: You’re right. I don’t think anyone gives us a lot of chance or hope. I think we've got a great group of kids. We’ve overcome a lot. The enthusiasm we had on a day like today has been very good. Had a good practice. You know, I think we surprised a lot of people all year long. You know, maybe we can surprise them with a win tomorrow and talk about something else going after that. Q. Joel, going into this series, there was a lot of talk about maybe this team, your team, being too young to be able to compete with the Stanley Cup champions. Has it been the youth and the inexperience that’s sort of made it tougher or is it just the fact that Detroit is skilled and experienced? JOEL QUENNEVILLE: Well, they’re a great team. That’s a measuring stick, you know, if you want to beat the best, you've got to go through Detroit. And I think, you know, I was very happy with how you can look at the first three games, all the games were tied into the third period. You know, if we got a bounce in the first two games in Detroit, it might have been a different story. Now it’s last game, they really stretched it apart on us. We feel we played well against Detroit in their building. We had a reasonably successful regular season against them. But that’s the door, the wall we have to get through to be champions. And I think it’s a great measuring stick. It’s a good challenge for us. We should not be satisfied with where we’re at today. So that’s the challenge we’re facing. I still think we've got a lot of excitement in our group and in our team, trying to get to tomorrow’s game. Q. Knowing those guys the way you do, the character, the fact they’ve won at other levels, would anything less than their best game tomorrow night surprise you? JOEL QUENNEVILLE: No. I think that we expect it. We feel that this group, you know, they’re so competitive on a game to game basis, the energy on our team with the young guys at this stage of the season still comes out. So we expect that we’re going to need every ounce tomorrow from every guy. But we need every guy to play their best game tomorrow. I think collectively that can help us try to get the job done. Q. So much is made about the depth of Detroit. Do you guys have to play differently if you’re down one or two men, like Khabi or Marty? JOEL QUENNEVILLE: No. No, not at all. I think, you know, whoever comes in their lineup, Huet getting thrown in in the middle of a game, Khabi not playing, some guys get a little bit more ice time, maybe Fras comes in tomorrow, different options. But I think our lines have been pretty consistent throughout most of these playoffs. I think inserting a player here or there has been in place all year long, or a different line mate all year long, during games, after games. But these guys have been very good at sliding in wherever they’ve been playing or whoever they’re playing with. Q. Huet took a lot of heat for Sunday’s loss. Do you feel how that might affect him if he has to play tomorrow or could that motivate him? JOEL QUENNEVILLE: No, I think you’ve got to bounce forward and look at the next opportunity. Goaltenders, it’s a position where you get a lot of scrutiny, a lot of attention, going forward, looking at the next challenge, the next shot, the next shift, that’s how you got to approach it. He won a big game at the end of the season for us. We expect if he plays, he’ll be fine. Q. I think yesterday you said that in order for Khabibulin to play, he would have had to practice today. Did he or Marty skate today? JOEL QUENNEVILLE: No, they didn’t skate today. But we’ll see tomorrow morning. If there were a textbook teaching NHL teams how to climb out of postseason holes -- a manual the Blackhawks might want to browse before Wednesday's potential season-ending Game 5 -- nobody would be more qualified to write Chapter 1 than Al Arbour. Arbour was coach of the New York Islanders in 1975 when they authored a playoff comeback for the ages by becoming only the second team to overcome a 3-0 series deficit. It was after that third loss to the Pittsburgh Penguins in the quarterfinal series when Arbour gathered his players for a speech that gets more legendary every spring. The Isles won four straight from the moment Arbour finished speaking. "I just said, 'If anybody thinks we can't come back and win this thing, then go to the dressing room this minute and take off your clothes. I never want to see you again,' " Arbour recalled on the phone from his home near Sarasota, Fla. "When you're down like that, you have to think one shift at a time, one period at a time. It's the playoffs -- you can't think beyond that." The Hawks, trailing 3-1 in the Western Conference finals, face a similarly daunting task that perhaps requires more mental discipline than physical skill. One reporter after the 6-1 loss to the Red Wings on Sunday even asked coach Joel Quenneville to compare the Hawks' challenge to the 1980 U.S. Olympic team's "Miracle On Ice" victory over Russia. Not in the mood to reminisce, Quenneville responded, "We've got to fight our way back into this, take a one-game attitude, and who knows?" History provides a pretty good idea. Only 21 of 233 NHL teams that have trailed 3-1 in a best-of-seven series have rallied to win the series, according to NHL.com. It has happened only once in the conference finals, in 2000 when New Jersey rallied to win the East against Philadelphia. But Arbour, who said he doesn't miss a playoff game on TV, speaks with the optimism of someone watching the Hawks from West Madison rather than western Florida when evaluating the series. 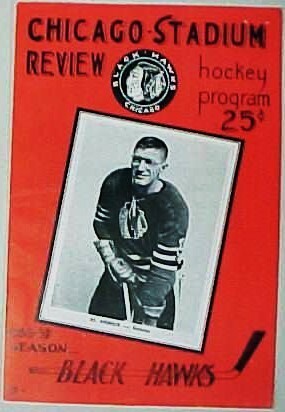 "If any team in the league can come back from something like that, the Hawks might be that team," said Arbour, 76, who's second all-time in victories behind Hawks senior adviser Scotty Bowman. "I don't have to give any advice to Joel Quenneville. He knows his team. They have good talent, they're young and they're well-coached. You can never know with kids like that." One of those kids, captain Jonathan Toews, expressed the resolve Chicago has come to expect from No. 19. Toews knows it will take more focus than the Hawks showed in Game 4, when they committed 16 careless penalties, but he set the only tone a team leader can set in the messy aftermath. "We have a lot of character in this room," Toews said. "If we think about winning three straight, that's a lot that weighs on your mind, so we just have to focus on the next one. We have to respond by playing our best game of the year." As Arbour told his '75 Islanders with an even higher mountain to climb than the Hawks have: one shift at a time, one period at a time, one game at a time. The Isles' success at sticking to that philosophy is one of the reasons coaches lean so heavily on the one-game-at-a-time cliché. One of the players on that historic '75 team, winger J.P. Parise, is the former director of hockey operations at Shattuck-St. Mary's boarding school in Faribault, Minn., where Toews attended. Parise knows the Toews family and attended Game 3 at the United Center, where he saw a Hawks team he wouldn't rule out, despite the odds. "It's very hard to be patient enough to actually go one shift at a time for [three] games," Parise said. "That's the secret. But why not?" It's the only question the Hawks can afford to ask themselves as the off-season looms perhaps only 60 minutes away. "We're a resilient team, a young team and we enjoy each other's company," defenseman Brent Seabrook said. "We have come back in these playoffs before, whether it's in games or in series, and we can again." Between now and Wednesday's puck drop, that mantra will be the soundtrack inside the heads of Seabrook and his teammates. Arbour knows from experience that, at some point, actions have to make all the words mean something. "You can talk about it all you want -- you just have to go out and do it," he said. "Everybody in that room has to believe coming back is possible. You can't do it unless that happens. It's too hard otherwise." wprager wrote: Do we need a separate cliche thread? It's all over for the Hawks tonight. Umm, fat lady warming up? Warning: do not watch if you've just eaten. Even before heading off for hostile territory, the Blackhawks began circling the wagons. They held a team meeting Tuesday morning at the United Center to discuss their plight of trailing the Detroit Red Wings three games to one in the Western Conference finals. Following that meeting and a spirited practice, they boarded a plane for Detroit for what they hope is one of three remaining games in the best-of-seven series. The Hawks enter Wednesday night's Game 5 at Joe Louis Arena vowing not to listen to the naysayers who already have them making tee times. "It's what we believe in the dressing room and what the coaches believe in," defenseman Brian Campbell said. "You try to leave that stuff to the outside world. We know what we're capable of doing. We know we're capable of playing better than we have in this series and we want to prove that [Wednesday] night." It's the belief that they haven't yet played well against the Wings that gives the Hawks hope following a humiliating 6-1 meltdown on Sunday. "The biggest thing is knowing in the first four games we've yet to play a good game," forward Adam Burish said. "If we win a game here, things can turn. The fact it's an elimination game and that there's no more pressure because nobody's giving us a chance anymore, that may give us a little bit of a lift. "Everybody's aware they've kind of written us off. You saw the way [the Wings] skated around during the end of [Game 4], kind of laughing at us and joking around. You saw the fans leaving early. It's like, here's a chance for us to prove some people wrong and try to climb back into this." The Hawks may have to try to stave off elimination without two big pieces of their puzzle. Star Martin Havlat and starting goaltender Nikolai Khabibulin didn't practice Tuesday and are questionable for Game 5. Both left Game 3 with injuries, but coach Joel Quenneville said they would make the trip to Detroit and their availability will be determined following Wednesday's morning skate. If Havlat, who is still recovering from a hit from Detroit's Niklas Kronwall in Game 3, and Khabibulin (lower body) can't play, Colin Fraser would likely join the forwards and Cristobal Huet would start in goal. "Everyone is probably counting us out," winger Patrick Kane said. "[The Wings] are the defending champs, they have a lot of experience and they pretty much took it to us last game. We still feel we have a lot better effort that we can put forward." During the Hawks' postseason run they haven't yet faced an elimination game, having dispatched both the Calgary Flames in the conference quarterfinals and Vancouver Canucks in the semifinals in six games. They did fall behind the Canucks 2-1 before regrouping and advancing to meet the Wings. "We've played pretty well under fire in the last two series," captain Jonathan Toews said. "It seems like when there's motivation and our backs are against the ropes, we always find a way to step up our game and play better. We just have to stick together and have fun as a team. We've had a great run this year and we just have to keep kicking and try to stay alive." wprager wrote: Umm, fat lady warming up? Update from the morning skate Wednesday: Nicklas Lidstrom (lower-body injury) and Pavel Datsyuk (bruised foot) won’t play tonight in Game 5 against Chicago, Wings coach Mike Wang said. Datsyuk skated in a sweat suit briefly before practice. Lidstrom rode the exercise bike. Or maybe you're another closet Wings fan? WORDS I LIVE BY (BEST ADVICE OR QUOTE): "Our greatest glory is not in never failing, but in rising up every time we fail." - Ralph Waldo Emerson "Success is not a destination that you ever reach. Success is the quality of your journey." Positive thinking. Now that's the spirit. True. Perhaps I should bring her back for the post game wrap up?